Wow, this second Friday really snuck up on me! But it is here, in all of its glory, right? So…here we go, another random Friday Five! 1. What’s up? How are you? Life is good here. Trying to be meaningfully involved and active and trying to not use the word “busy”. Have just finished what seemed like a long stretch of travel and am glad to be back home for a while. But the travel was good too. The Covenant Network‘s Marriage Matters Conference was awesome, if I do say so, myself. (Disclaimer–I’m on the Board). Thankful for the connectional church, even if it causes me to miss my colleagues and friends with much wistfulness some days. I have a good balance of social/work/family activities in the coming weeks, so am happy about that too. Sermonizing today and thankful for a schedule that allows me time to ponder and write. 2. If you were a Panda Bear that could speak O.k., even that is too random for me. You are moving to a new office. You can only take five books with you (pretend there is no thing such as kindle, nook, etc.). What would they be BESIDES the Bible, which is already written on your hearts, yes? I’m guessing these are supposed to be church-y books, but I think good fiction makes me a better human, so this list may be heavy on that end. And Calvin’s Ladder: A Spiritual Theology of Ascent and Ascension by Julie Canlis–this is the church-y book I’m reading now. I would teleport myself and family to Paris. I love wandering the streets of Paris and the rest of my family has not been there to experience it. And you have to go to Paris to see this painting. I got two new albums this week that I love. Juana Molina’s Wed 21. It’s not the usual music you hear on the radio. There are many layers to it. Beautiful voice. Haunting. Electronic. Love it. 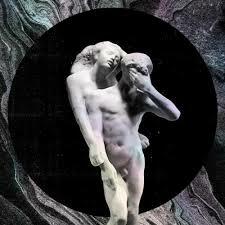 And then the long awaited new album from Arcade Fire. I love them so much (even though I appear to be alone among my friends and family in this love). Reflektor. I do love this album. We’ll have to see if I end up loving it more than The Suburbs, which is a masterpiece. The coach of the NBA expansion team Pandas smiled as he watched his basketball team tangle in their scrimmage. The hook shots had him worried, but they could dribble through the Sharks, Lakers, and Celtics ranks with ease and would certainly earn a trip to a tropical island at the end of their first season. Okay. There’s my Five for the week. How about you? November 8, 2013 in Friday Five, Reflection. ← 30 Days of Thankfulness? Well! Those sentences are just the best. I don’t know either of the bands/musicians you mention, will have to check them out. My fiction books, which feed my soul, are all on my Kindle, which apparently we were not to bring to the office, so alas, all churchy stuff for me, except Anne Lamott. Like your list of books! Marci, I lived in Nampa for a year, when I was in the fourth grade. All I remember of Boise is a rodeo we attended with Michael Landon who told silly jokes. Many of my family members are from Pocatello, I think my mother was born there? Perhaps one day I will make it back and meet you IRL! It may have changed here since the 4th grade! Let me know when you end up in this neck of the woods. Awesome use of random words! I love Paris, too….and your books are great choices! I think fiction makes me a better person, too. 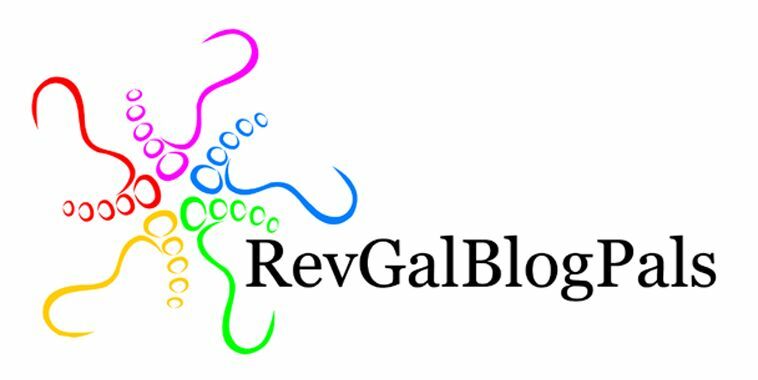 I am also going to check out the tunes–I am overdue for new music and am in a rut! Love to you! Would be fun to wander the streets of Paris with you, Karla! My most recent experience with “connectional system” left me with the reminder that the “good ‘ole boys club is alive and well”. Blech!!!! Stunning art work. The name? 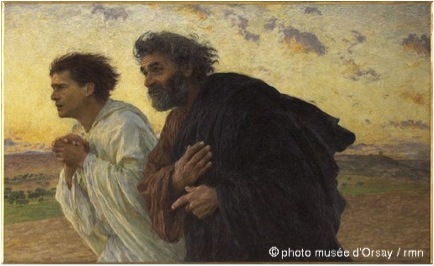 Eugene Burnand’s “Peter and John running to the tomb on the morning of the resurrection,” It is at Musee D’Orsay. Sorry you have not had such a positive connectional church experience. Having worked in the church for so many years, I have good colleagues all over the country and I don’t get to see them nearly often enough and am grateful when I get those opportunities. I almost included a cookbook in my book collection, but that seemed a stretch. I’m not familiar with the music, either, but isn’t that why we visited each other, to learn and grow and connect? You sound like you’re in a great place, and I am glad for you.